After a day of rain yesterday beautiful day today. It’s Sat so no progress on repairs. 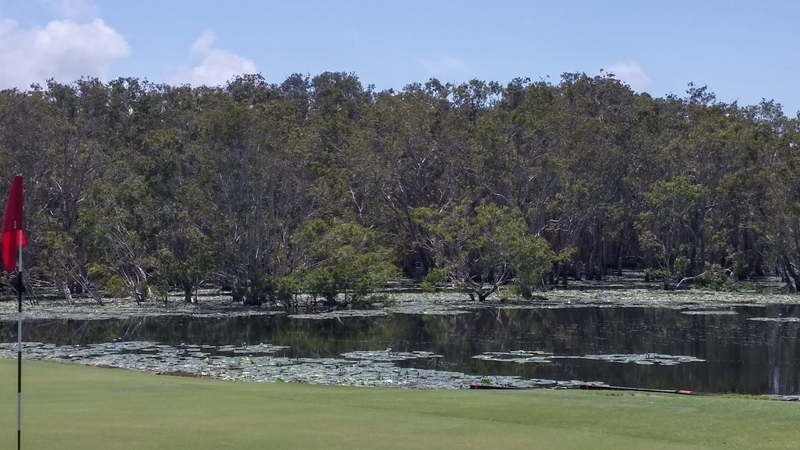 Off to play golf – went to the Capricornia Resort Championship golf course – all other local courses had comps. Rather sad the Capricornia resort and resort golf course are now closed – the resort has metal fencing all around it – wonder what will happen??? I hear someone is proposing building the same enormous golf complex on Hummocky Hill Island off Turkey Beach just 120K away – do these companies do any research?!!!!! The course is just beautiful and of course challenging – I got 3 pars and a questionable birdie (fluffed the first drive). 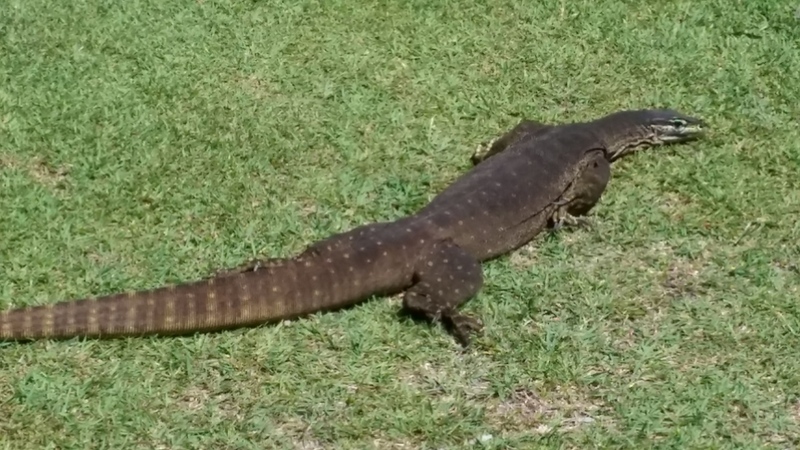 It’s taken 10 months of travelling to see our first goanna!!! This one tried to flatten himself and look like a fat snake Plenty of water on this course! Think we were about 8 balls lighter by the time we finished!!!! Golf again – this time at Rockhampton. Well that was different but I did get a birdie. Day of sorting. Read in a blog about spare tyres on a Swift caravan that they put the spare tyre under the bed not under the caravan – made it easier to get to and equalised weight distribution. 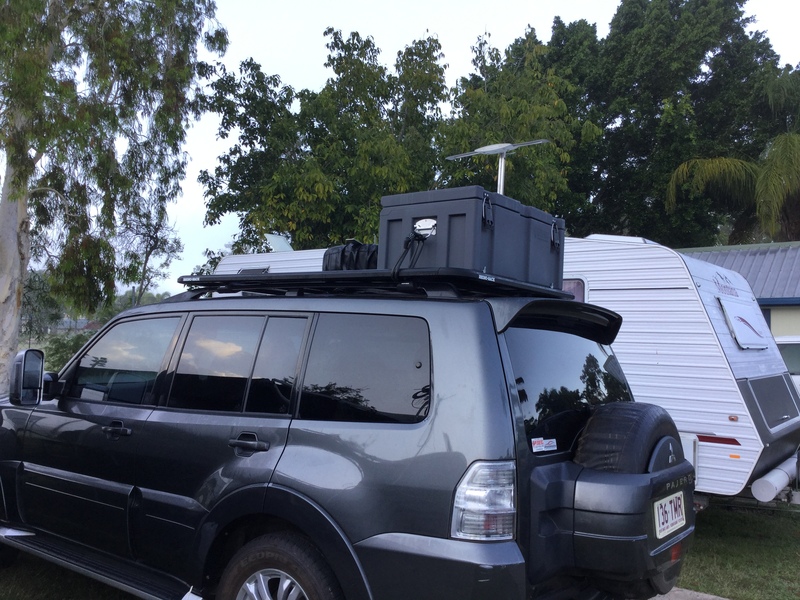 Decided to take ours off car roof, where it has been since we got new caravan tyres also because of hitting the roo on the Nullabor – and do the same. This meant rearranging the car roof and the locker under the bed. We’d bought a roof box to put stuff from under the bed in – including the blow up kayak which this time we haven’t used!!! Last trip we used it a lot. That done we decided to rearrange the inside of the car. All this in the heat & sun – time to pull out the frozen lemon segments for a lovely cool drink. Caravan bra (stone guard) has gone to get new zips – should be ready on Wed!!! I must praise Leigh at Swift Brisbane. Every time we have a challenge with the caravan he responds and sorts. Some things take a while but he has the sun window (cracked back in Jan), the alarm ( broken in Dec) and the skid (broken in April 2014) ready for us – all ready under warranty for our return. Seeing as the caravan is 3 years old we think this is great service compared to other manufacturers who only do a 6 month or 1 year back up service. A question keeps coming up in my mind – as I sit on the loo – any loo in any caravan park – Why do you need 3 or 4 coat hooks on the back of a loo door???? Beats me – is there something my mother never told me???!!!! Does anyone have the answer – ’cause every loo I’ve been in on this trip has them – 3 or 4 hooks !!!!! Caravan hitch due to be repaired on Friday – should be all sorted by our return !!!!!! This entry was posted in Uncategorized on September 13, 2016 by aloeliz.